Warm temps, melting snow and dewy grass are all signs that spring is near. Along with the joys that spring brings is a substantial increase in mold spores flying throughout the air. Rising temperatures make it easy for mold spores to flourish—along with tree blossoms and the pollen count. When the amount of mold spores intensifies in the great outdoors, it becomes likely that floating spores will find their way into your home. 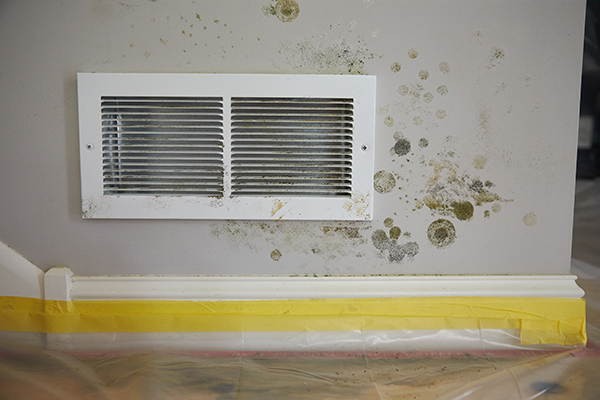 Mold is a type of fungi that occurs naturally throughout the environment. Spores are typically found everywhere in nature and often benefit the ecosystem. Molds disintegrate biodegradable materials and are even used to make modern medicines, like penicillin. However, it’s only when mold enters your home and thrives that it poses as a significant problem. Of the nearly 100,000 mold species scientists have identified, only about 80 are deemed a health risk to humans. Mold can provoke allergy symptoms, cause a runny nose and watery eyes, coughs and itchy skin. People with compromised immune systems are susceptible to infections due to exposure to mold spores. 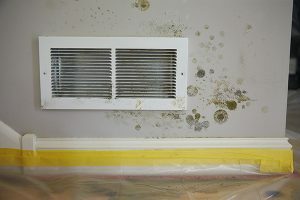 In addition to causing numerous health problems, mold destroys building structures and any materials upon which it feeds. Organic materials that mold sustains itself upon include leather, drywall, damp carpeting and even the hidden surfaces behind wallpaper. Given the dire consequences of mold growing inside your property, it becomes especially important to keep an eye out for any signs of mold growth. Given the dire consequences of mold growing inside your property, it becomes especially important to keep an eye out for any signs of mold growth. Since mold spores develop abundantly in springtime weather, the start of spring makes it an ideal time to inspect your home for mold growth. When you burst open the windows to let in the fresh spring air and invigorate your home after a dismal winter, you’re also inviting in a flurry of mold spores. These floating spores are harmless—until they land in a damp spot and begin to thrive. Mold sustains itself on moisture. That’s why homeowners frequently see mold splotches in bathrooms, in damp basements and under sinks. If your home has any leaks, due to a frozen pipe burst over the winter, for example, that area should be examined thoroughly for any signs of mold growth. Not all plumbing issues are evident; some leaks are very minor. Still, even insignificant wetness offers a viable source of nutrition for mold spores. Plumbing leaks should be fixed right away. Removing the mold from the dampened area is ineffective if the source of the moisture is left untreated. The mold spores will simply grow back along the wet area. To tackle the mold, the source of the moisture problem must be addressed first. Snow melts in early spring unleash a wave of moisture into the indoors if the property is not properly sealed. It so happens that the basement receives the brunt of the problem. Basements are a favorite spot for mold spores to grow due to the constant dampness and darkness that provide ideal conditions for mold to prosper. Due to the likelihood of moisture in the basement, homeowners should inspect any crevices, along pipes, and the areas surrounding foundation cracks for signs of mold. The spring thaw is not the only time moisture enters a home. Throughout spring, heavy rainfalls are a likely event. The excess water can leak into a property, giving mold plenty of reasons to take hold. Regularly inspect the basement for any indications of water intrusions and its consequence, mold. Condensation is a common problem in many households. Water droplets that accumulate along windows can serve as a reliable nutrient source for mold spores. It is important to wipe down any condensation that forms. An even better solution is to seal the windows so that condensation does not continue to form. 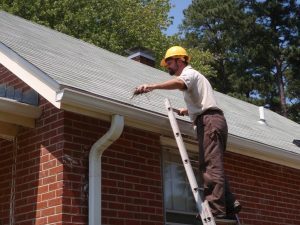 Check your home’s gutter system and roof for any flaws. Check your home’s gutter system and roof for any flaws. Moisture can penetrate faulty roof shingles or be redirected toward the home by a defective gutter, contributing to moisture issues. Pooling water can lead to damage inside the attic and the surrounding walls of the home. The dampness then leads to a mess of mold growing inside the attic or behind the drywall. Clean out the gutter to remove any blockages and ensure the water is propelled away from the home and its foundation. Clean the HVAC system, which can harbor mold spores. When you turn on the air during warmer weather, the existing mold spores within the HVAC can spread throughout the home. Experts recommend cleaning the drip pans and drain lines of the air conditioner as well. Keep the humidity inside to an optimum level, one that does not encourage mold growth. An ideal humidity level is anywhere between 30 and 50 percent. Homeowners may also wish to run the air conditioner as an alternative to keep the indoor air dry and cool. Mold does not differentiate. Spores will find a home in the most unlikely places, especially when conditions are right. Moisture, an organic food source and warmth are all that mold spores require to sustain themselves. As a result, mold can be found growing on mattresses, on upholstered furniture, on pillows and even inside the chimney. When you discover an infestation of mold within your home, take immediate steps to remove it. Ignoring the mold only allows it to further damage the property upon which it has taken hold. ServiceMaster by Restoration Contractors is skilled in the removal of all traces of mold within residential homes or business properties. Our trained technicians at ServiceMaster by Restoration Contractors first assess the property damage, test the mold, and develop and implement a mold remediation plan. Our specialists also report their initial findings to the homeowner’s insurance. ServiceMaster by Restoration Contractors’ mold removal procedures are extremely effective in removing mold and preventing its return. We team up with an environmental testing agency to detect even hidden mold within the property. ServiceMaster by Restoration Contractors reliably serves the residences and business communities of Fort Wayne and Northeastern Indiana and is available to take your call 24 hours a day.